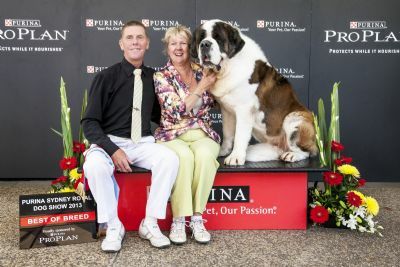 " NEWS FLASH " ATTAINES HIS GRAND TITLE "
COOPER WINS BEST OF BREED AT THE 2013 PRESTIGIOUS SYDNEY ROYAL EASTER SHOW. 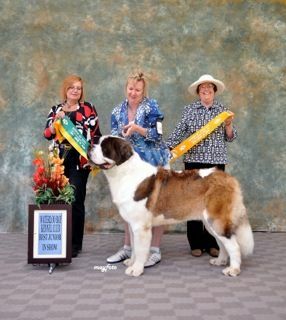 COOPER ALSO WINS BEST OF BREED AT THIS YEARS 2013 "EKKA" ROYAL BRISBANE SHOW GREAT EFFORT FOR THIS YOUNG DOG. 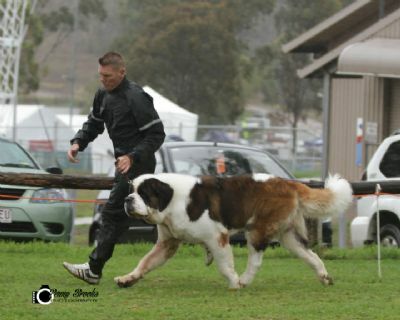 THIS AWESOME YOUNG BOY HAS A LOVELY TEMPERMENT VERY OUTGOING AND WILLING TO PLEASE HAS GREAT MOVEMENT WITH GREAT REACH AND DRIVE EXCELLENT BONE AND SUBSTANCE IMPRESSIVE OUTLINE ON STACK HOLDS HIMSELF WELL AND IS A POWERFULL YOUNG DOG AT ONLY 10 MTHS OLD WILL TURN HEADS AS HE MATURES AND HIS SHOW CAREER CONTINUES. POWERFULL AND IMPRESSIVE YOUNG DOG, HEAD DEVELOPING WELL, EXCELLENT LENGTH OF LEG - ALL IN PROPORTION AND GREAT LEVEL TOPLINE CARRIES HEAD CORRECTLY HARD TO LOOK PAST - OVERALL POWERFUL TYPE. WE WOULD LIKE TO THANK ALL THE LOCAL,INTERSTATE AND VISITING INTERNATIONAL JUDGES THAT HAVE ACKNOWLEGED THE TYPE,POWER AND REACH OF THIS YOUNG DOG.